Bharati Vidyapeet University is a deemed university catering education in various domains. 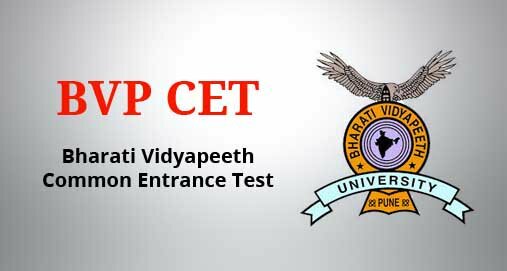 The university conducts entrance examination in the name BVP CET abbreviated as Bharati Vidyapeet University Common Entrance Test to check the eligibility of candidates to seek admission in the reputed institution. BVP CET is a university level exam taken to select aspirants for various Engineering degree courses offered by College of Engineering, Pune on the basis of the merit obtained by them. The examination is been conducted every year under the supervision of admission authorities of BVP. BVP CET 2019 will commence in the month of May 2019 and based on the results of the candidates, they will be called for counseling which will be held soon after the declaration of results. The details regarding the entrance examination is jotted down in the below article for reference. Bharati Vidyapeeth University declares the BVP CET 2019 schedules through its official website. The application form will be made available for the students from January 2019. Though, it is essential for applicants to check the eligibility criteria of BVP CET 2019 before applying. Bharati Vidyapeet University have set certain eligibility criteria for the candidates willing to appear for BVP CET 2019. In case the aspirants fail to fulfill the eligibility criteria he/she will be disqualified from the admission process. Age: Aspirants appearing for BVPCET 2019 should be of 17 years of age (minimum) as on 31st December 2019. Qualification: Aspirants should have completed or pursuing 12th or intermediate from a recognized board to appear for BVP CET 2019. Required Score: Aspirants willing to appear for BVP CET 2019 will have to attain a minimum of 45% aggregate in 12th with mandatory subjects like Physics, Chemistry and Mathematics. Bharati Vidyapeet University released by the BVP CET 2019 application form in online only on January 2019. Aspirants willing to appear for the entrance examination will have to submit the application form within the provided duration. Uploading Documents: After the payment aspirants will have to upload the scanned copy of the recent photograph, signature and thumb impression. Form filling: Post documents uploading, candidates will have to fill the application form by providing accurate personal and academic details. Taking Printout: After filling the form submit it and take the print out of the duly filled application form for further reference. Registration: Candidates will have to visit the BVP CET 2019 official website and register themselves by providing the required details to access the login id and password that will be generated. Payment: Aspirants can make the payment for the entrance examination through online mode i.e. via net banking/credit card/debit card. While formatting the BVP CET 2019 examination pattern elements like mode of exam, duration of exam, format of exam, total score, number of questions and many more. Aspirants will have to check for the exam pattern to ease the preparation for the examination. Mode of Examination: BVP CET 2019 entrance examination will be conducted in pen and paper mode. Medium of Examination: Entrance examination for Bharati Vidyapeet University will be conducted only in English language. Duration of Exam: BVP CET 2019 entrance exam will be held for 180 minutes i.e. 3 hours in total. Exam Paper Format: The exam paper consist of objective types questions. Questions are based on multiple choices, each question will be provided with 4 options. Subjects: Subjects like Mathematics, Physics and Chemistry/Biology are included in BVP CET 2019 question paper. Number of Questions: BVP CET 2019 exam paper will be prepared with total 200 questions for the total of 200 marks. Marking Scheme: In BVP CET 2019 exam paper, each correct answer will attain 1 mark. There will be no negative marking for the wrong and unanswered questions. Admit card for the Bharati Vidyapeet University entrance examination 2019 will be released through online mode. Aspirants registered for BVP CET 2019 can login with their login Id and download their admit card. Admit card will be available after the successful payment of application form fee. Login to the Admit Card link from BVP CET 2019 official website. After the admit card is displayed check the details and take the print out of the same. Results for BVP CET 2019 will be declared by the admission authorities of Bharati Vidyapeet University. Aspirants appeared for the examination can check the results and download it through online mode from its official website. Visit the official website of BVP CET 2019 and navigate to Results link. Login with the provided login Id and password and click on submit. Once the result is displayed download and take the print out of the same. Counseling sessions will be conducted for BVP CET 2019 by the admission committee of Bharati Vidyapeet University. The counseling process will commence soon after the declaration of results. Candidates should be physically present during the counseling process. BVP CET 2019 examination centers are been located in 11 different cities of the country. The admission authorities of Bharati Vidyapeeth University have set up the exam center considering the need of the applicants willing to appear for the examination.